Looking For Lydia? Where Did I Come From? The women in her book had several common bonds: aging, a Bible study and shared residence at the Lydia Roper Home. As Dean led them through a study of women in the Bible, the complexity of how “life showed up” shone through the pages of the Bible and Ms. Robertson’s book, Looking for Lydia, Looking for God. Those are the questions threaded in the reveal of the lives of the residents of the Lydia Roper Home. Just as the women of the Bible made their mark from birth to death, the core group share their road maps. They shared decades of history growing into women, motherhood, careers– and unanswered prayers that changed pathways. Dean Robertson tries to learn more of the woman, Lydia Roper, the namesake of the home originally dedicated to care for widows of Civil War veterans. 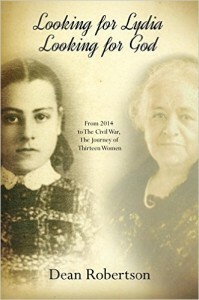 The author is driven to answer the above questions and trace the footprints of Lydia during her ninety years on earth. Dean takes a dusty jewel of a woman’s life and discovers the refraction created in those around her. Thanks, Dean Robertson, for allowing us to look and learn about a piece of your life. This entry was posted in Musings and Amusements and tagged Dean Robertson, Looking for God, Looking for Lydia, Lydia Roper, Lydia Roper Home by KVarn. Bookmark the permalink. Life is full of surprises. Some good some bad. As long as we are still here breathing we can experience and cherish or leave them behind. Yep, and sometimes the sifting of what to leave and what to keep comes with a few skinned knees and darts to the heart. Kat, thank you so much. This is terrific and, yes, I agree about that passage. If you recall, it’s from my friend, the Baptist preacher, who–saying that–gave me the book’s title. It was, as I’m sure you could tell, a piece of writing straight from my heart and–in response to you, Steve–absolutely we are all still, and will be always, looking for God. But for those few months when I wrote this book I came closer than I usually do. I am a person who has come to believe there are no answers. Our task is to ask the good questions. Thanks again, Kat. You’re welcome, Dean. And, I did know it was the words of the Baptist preacher but didn’t want to distract from the beauty of that statement. I love observing the story of someone’s journey. Your application of good questions to your friends’ life journey, moved me so deeply that I had to wait a few days to settle. So, I look forward as I too, look for Lydia as I look for God.